One of Mallorca’s top restaurants has been named in the prestigious 26th Annual ‘Best of the Best’ Robb Report. I should add that I’m not a typical reader of this august organ – not being one of the “ultra-affluent consumers” it targets, and therefore unable to splash the cash on the prestigious global luxury brands it has showcased for more than three decades. But, hey, the 2014 report features something luxurious that I have experienced: chef supremo Fernando Pérez Arellano’s Michelin-starred cuisine at his restaurant Zaranda. At the age of 27, in 2005, Fernando opened Zaranda in Madrid, soon gaining a Michelin star. Since the restaurant – and its entire team – relocated to Mallorca, it has continued to impress the Michelin inspectors. Last spring, Fernando moved Zaranda again – to the beautiful 5-star Castell Son Claret hotel in the countryside outside Es Capdellà, in the southwest of Mallorca. 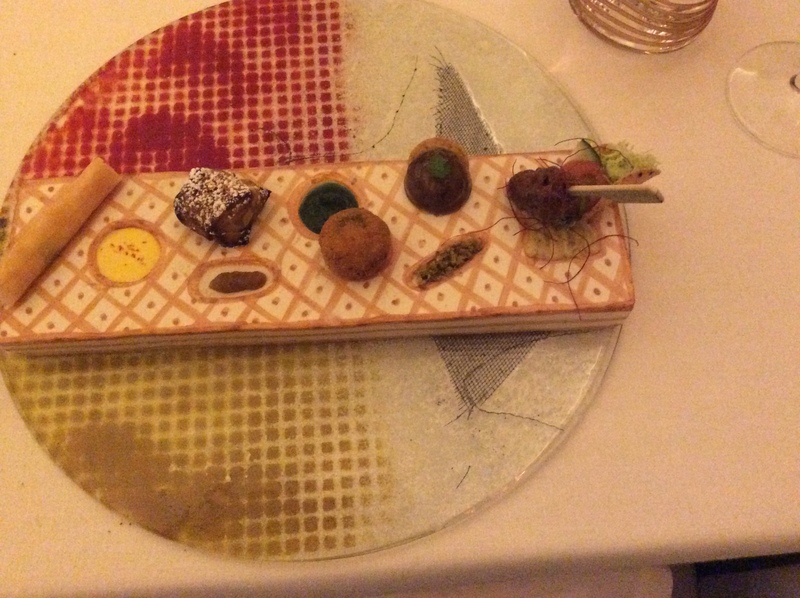 I was fortunate enough to dine at Zaranda recently, enjoying one of the several tasting menus. Each dish is made from the very best of Mallorcan produce from the land and sea. The cuisine reflects Fernando’s love for the island he’s adopted as his home – and his culinary experience. He honed his skills in some renowned restaurants, including: Patrick Guilbaud in Dublin; Le Gavroche in London (with one of my favourite chefs, Michel Roux Jr); Don Alfonso 1890, Naples, and Can Fabes in Barcelona. Fernando also highlights some of the artisan skills for which the island is renowned, by commissioning exclusive pieces of tableware for Zaranda – such as the elegant glass chargers on the tables and purpose-designed plates and bowls for specific dishes. Zaranda has been critically acclaimed a few times but, with this latest recognition by the Robb Report, it’s just possible that – like former mentor, Michel Roux Jr – his cuisine may soon boast a second Michelin star. In the meantime, congratulations to Fernando and his talented team.